"I knew the WGI Register would be impressive and on an unprecedented scale. Nevertheless, simply holding it in my hands and seeing it on pages exceeds all expectations and makes waterlily history. 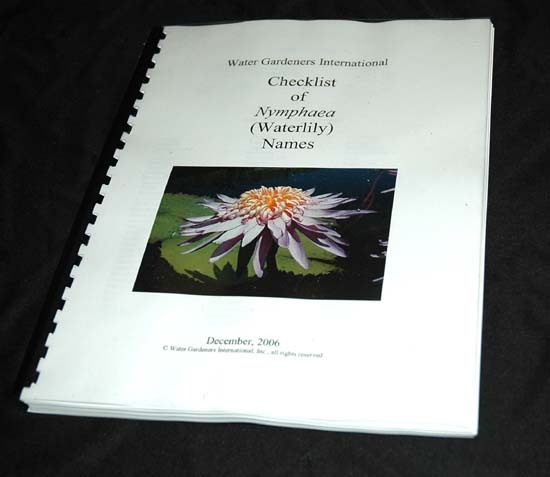 No book comes close to presenting all the comprehensive research you have published in it for anyone interested in waterlily identification and other facts. 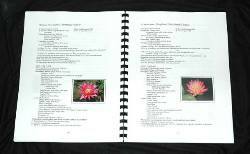 The WGI Register joins the very small number of books as a must-have waterlily text on an international basis." "Quite a valuable resource . . . nothing like it in print anywhere." "Beautiful . . . a remarkable publication"
"Impressive . 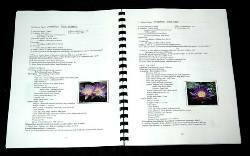 . . an excellent job"
A limited number of copies has been printed. Each copy of this historic document is numbered and signed. 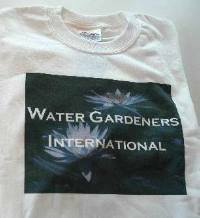 To order, first reserve your copies by writing info@watergardenersinternational.org. 1. A bank draft or money order made payable to WGI in US funds for $50.00 per copy plus Airmail postage for an 18 ounce per copy package to your country. We do not acccept wire transfers of any kind, including bank to bank, Western Union or Moneygram. See this page for calculating postage to your country. Copies will be held for 30 days from receipt of email reservation. After that time, they will be released to others.